Kelly Blackburn Fitness Expert for TOUR professionals and The Golf Channel, has traveled the TOUR circuits since 1994 working with golf’s greatest athletes. She has trained thousands of amateurs and prepared many for Q-school. Kelly has authored 2 golf fitness books, has a complete line of golf fitness DVDs and training aids! Her workshops and clinics feature information on trends in golf fitness, mechanics of the swing and muscles involved, the direct benefit of each exercise in relation to the swing and its immediate benefit to performance on the course. Experience this unique approach to enhance your own golf performance and instruction! Your clients will experience increased club head speed, distance, power, focus, concentration and reduced risk of injury! Workshop: A workshop is defined where Kelly Blackburn will come to your facility to personally work with professionals to become certified Golf Fitness Trainers. Qualifications: Certified Fitness Professional or Certified Golf Teaching Professional. You Provide: The specific type of room(s) and or outdoor area with the amount of space required will be determined by the number of projected participants. To ensure a quality educational experience, the environment needs to be free from outside noise and distractions, adequate restroom facilities be provided and that the room (if chosen to conduct indoors) is cleaned and climate controlled. You receive: Your facility will be advertised on our monthly schedule. For each participant outside of your facility that attends the workshop, you will receive a 10% discount for each of your own professionals for hosting the Golf Fitness Trainer Certification training workshop. Example: if there are 5 participants outside of your facility participating in the workshop, then you receive a 10% discount for 5 of your professionals. There is no fee for hosting the workshop. Attendance Requirements: There is a minimum attendance required of 25 participants. We Provide: KBE advertises the workshop. KBE will process all workshop registrations and fees. KBE will ship all materials & equipment to workshop site. KBE will provide airfare, hotel, meals & transportation for Kelly Blackburn. If you're a fitness professional or golf professional, interested in becoming a Certified Golf Fitness Trainer, these frequently asked questions will explain all of the advantages of Golf Fitness! 1. What are the benefits of Golf Fitness? The benefits of Golf Fitness have a proven record at the highest level of the sport…PGA TOUR professionals. Added distance off the tee, increased power behind the ball, more consistency through 18 holes, a higher level of stamina for the finishing holes and increase in overall fitness! 2. Will Golf Fitness correct my slice or hook? Although Golf Fitness was designed to enhance the muscles that dictate the golf swing, it is not the cure for bad swing mechanics. Golf Fitness Trainers work hand in hand with PGA and LPGA teaching professionals. Participants inquiring about their overall swing mechanics are referred to their local teaching professional. Another added bonus for participants taking Golf Fitness is that they are encouraged to use mirrors to insure their swing mechanics are "up to par" as instructed from their teaching professional. 3. Can anyone participate in Golf Fitness? 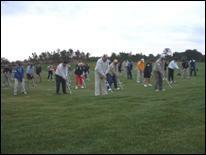 Because Golf Fitness details swing training, it is advised that the participant be familiar with the golf swing. An introduction to the innovative Golf Fitness swing trainer will be conducted to review the basics of gripping and swinging the club properly. Golf Fitness Trainers will always encourage the novice to consult their local PGA teaching professional to develop correct swing mechanics before continuing Golf Fitness on a regular basis to avoid developing incorrect habits. 4. What ages can participate in Golf Fitness? 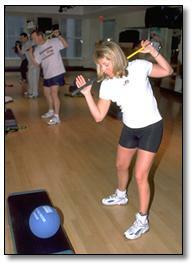 Golf Fitness was designed for all golfers of both genders ages 12 and older. Participants of all fitness levels and skill levels are instructed by Golf Fitness Trainers to conduct each exercise according to their comfort level based on a par, birdie and eagle system. 5. Is Golf Fitness for the off season only? Absolutely not! Golf Fitness was designed as a year-round training program. It's important that the player maintain peak condition in order to maintain peak performance on the course. 6. What results can one expect from Golf Fitness? PGA TOUR Professionals have doubled their strength, tripled their flexibility and have seen up to 20 yards in added distance off the tee. Amateurs have experienced an average of 12 yards in added distance off the tee, greater strength, flexibility and more energy through 18 holes. Those that experienced shoulder, back and neck problems in the past lowered their risk of injury and witnessed little if any pain in these areas after six months of Golf Fitness training. Branding: Golf Fitness has been exclusive to PGA TOUR players. This program has been tested and refined and has a proven record at the highest level of the sport. We've developed a well-known industry brand from which you can now benefit. We even offer marketing materials for you to use in your business. Golf Fitness Equipment: The swing trainer, flexibility trainer, power cord, power ball and DVDs are exclusive teaching instruments for the Golf Fitness program used in conjunction with health and fitness facilities throughout the world. Over 100 PGA TOUR professionals use this same equipment to enhance their golf performance. ENHANCE YOUR CLINICS & CORPORATE OUTINGS! CLINIC: A clinic is defined where Kelly Blackburn will come to your outing to personally work with golfers in a group environment. You Provide: The specific area with the amount of space required will be determined by the number of projected participants. To ensure a quality experience, the environment needs to be free from distractions, have adequate restroom facilities and if chosen to conduct indoors, clean and climate controlled. You also provide airfare, hotel, meals & transportation for Kelly Blackburn. Train with PGA TOUR professional fitness consultant Kelly Blackburn as your personal instructor the same way she trains advanced players and all levels of touring professionals. You will receive an analysis of your golf swing, overall game, physical analysis and one-on-one instruction from Kelly Blackburn. Kelly will then write a personalized prescription including the drills and concepts taught that need to be practiced to take your game to the next level. You will then work for two hours one-on-one with Kelly to review and reinforce those drills and concepts. Kelly Blackburn has traveled the TOUR circuits since 1994 working with golf’s greatest athletes. She has trained thousands of amateurs and prepared many for Q-school. Kelly has authored 2 golf fitness books, hasa complete line of golf fitness DVDs and training aids!